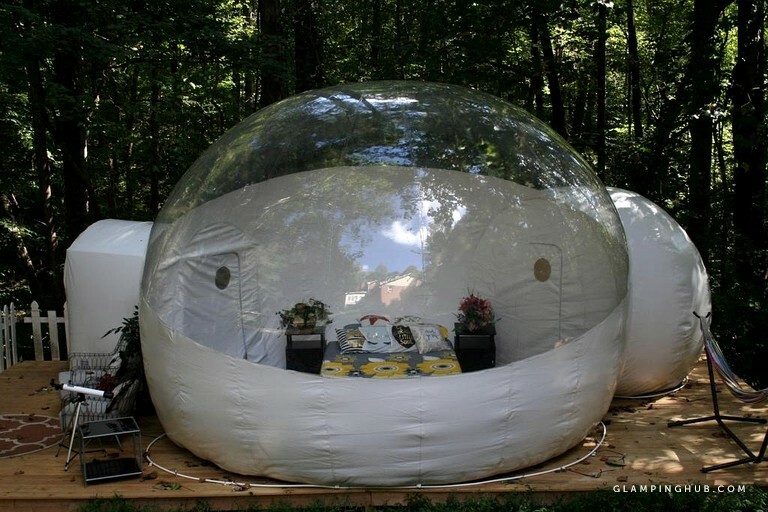 Set just a short distance from the heart of Stone Mountain, Georgia, this unique dome tent rental is the perfect choice for couples keen to enjoy a secluded vacation. The tent sits on 10 acres of rural land and boasts plenty of privacy in the woods. 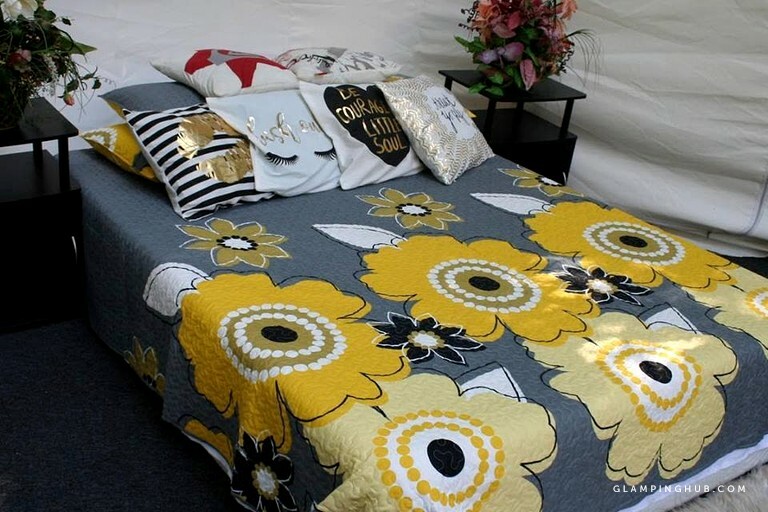 A total of two guests can be accommodated inside, as the tent is fitted with a comfortable double bed that is dressed in lovely linens to help glampers sleep peacefully. 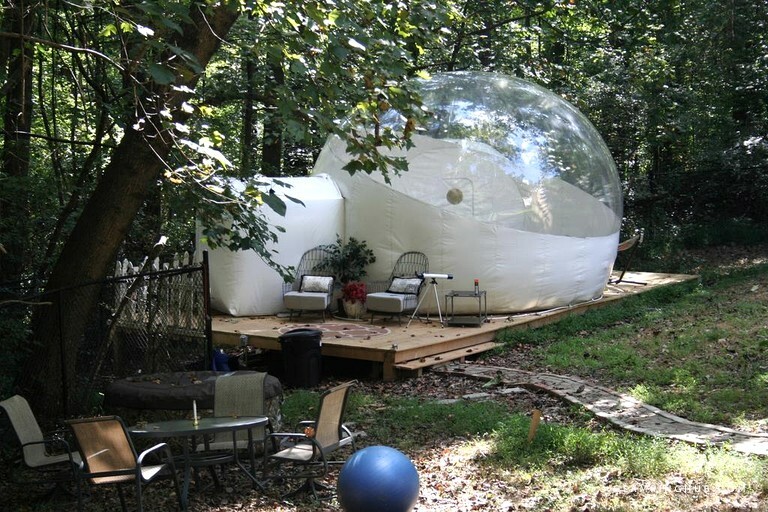 Glampers will be able to relax in style in this unique bubble tent. Linens are provided for the deluxe double bed and there is Wi-Fi installed throughout. There is also a TV for evening entertainment that boasts Netflix, Hulu, HBO, Prime, and more. 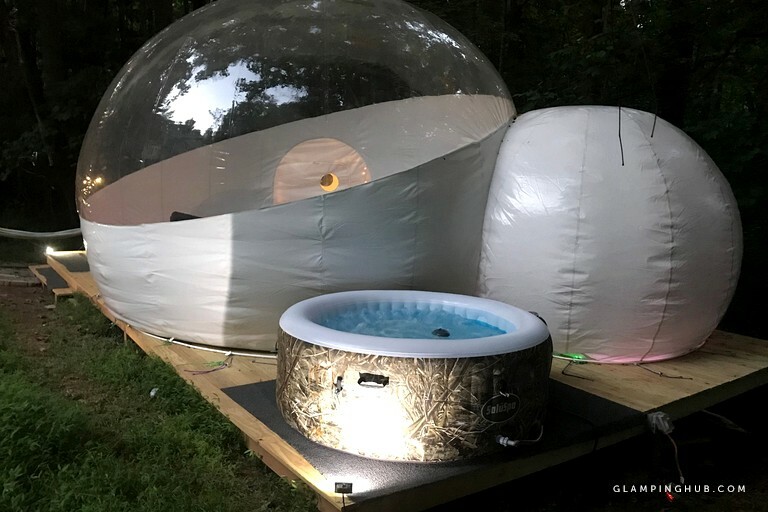 For a truly special experience, guests are invited to enjoy a soak in the bubble Jacuzzi, before roasting marshmallows over the fire pit. 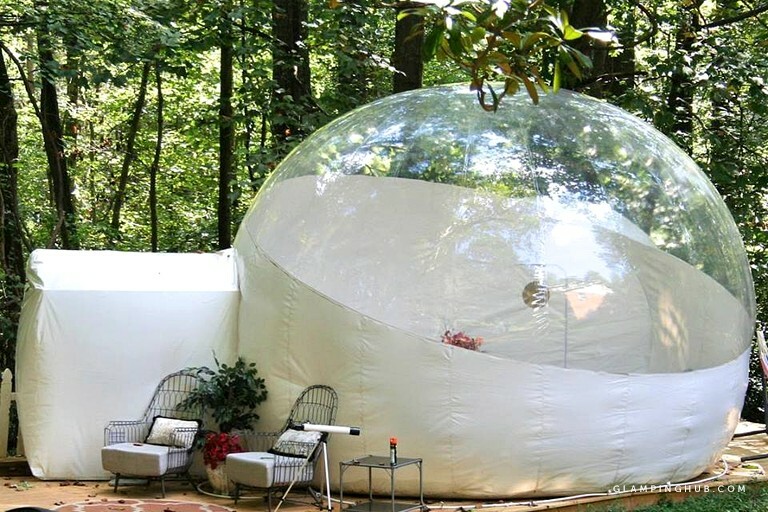 This amazing bubble tent boasts a prime location on 10 acres of rural land just outside of Stone Mountain in Georgia. 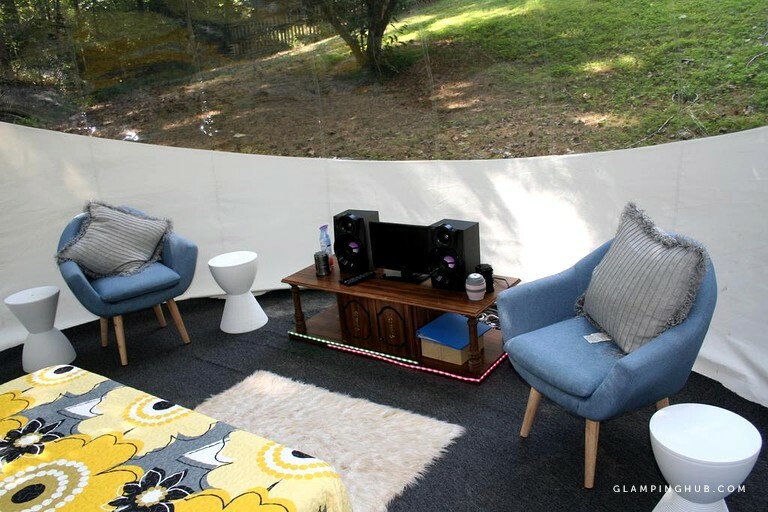 Glampers will find themselves nestled in the woods, making this a wonderful choice for those keen to escape the buzz of city life for a few days. There are miles and miles of trails to discover right from the front door of the rental, along with charming towns. Specifically, the historic center of Stone Mountain Village can be found just five kilometers away, while the stunning Stone Mountain Park is just six kilometers from the bubble tent. 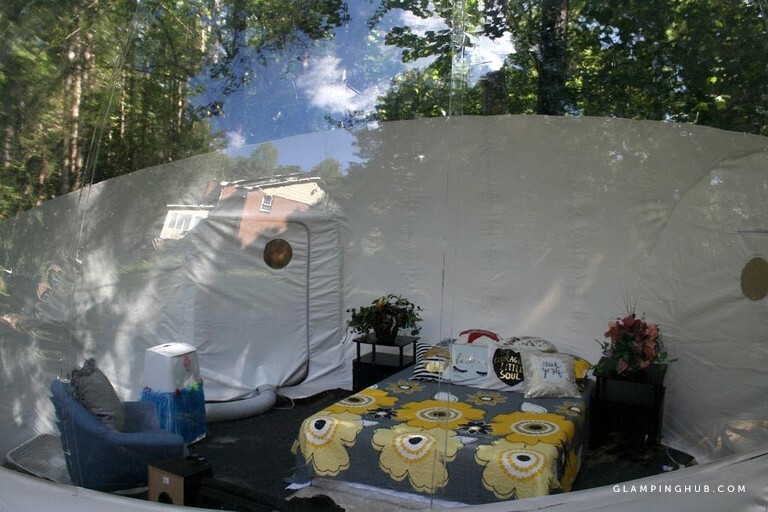 The location of this bubble tent makes it a great chance for glampers to take things easy. The surrounded woodland is a wonderful place for a hike or a scenic picnic, although glampers are welcome to simply enjoy relaxing in the sunshine with a soak in the Jacuzzi. For those keen to explore the area, many trails lead out from the tent, or guests can head to the beautiful Stone Mountain Park. Here, Stone Mountain Lake offers plenty of exciting water-based fun to be had, including swimming, fishing, and kayaking. 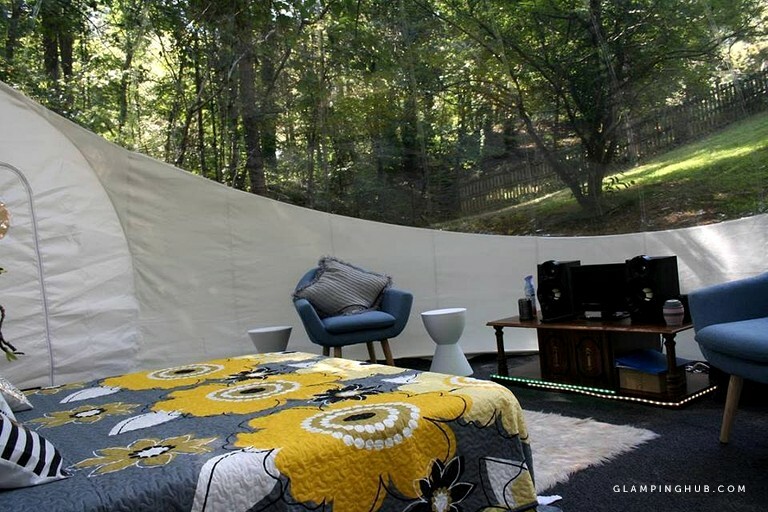 For glampers keen to learn more about the history of the area, the center of Atlanta can be reached just a short distance away. There are many museums to enjoy visiting, or glampers can enjoy a quiet stroll through the popular Botanical Gardens, before refueling in one of the many restaurants or cafes. Pets are not permitted and the rental is not suitable for children.